HiVOIM is nanofibre structure created during process of electrospinning. Hivoim structure is builted under influence of surface conductivity. I created special transfer backround,where are conductive and nonconductine lines. 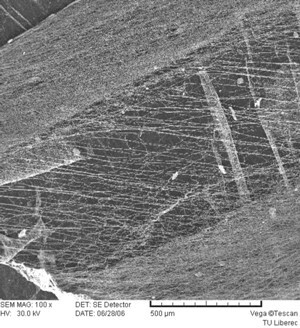 Nanofibers are precisly organised in places of high voltage . This phenomenon makes HiVOIMs and I am able to rule the process. HiVOIM is picture ,existing in nanospace and can be visible in electron microscope.